All dog owners want to do their best for their loyal, loving canine friends. That includes looking after their physical comfort as part of their overall health and well-being. Whether your dog is under the weather or needs a helping hand with staying warm in cooler conditions, sometimes his usual sleeping places just aren’t sufficient. Many dog parents, therefore, consider buying heated dog pads for their pets. But what are the advantages and features of a heated dog pad? Are they safe overall, and what should you be looking for before you buy one? In this article, we look at all these issues and more. First, here’s our round-up of the best heated dog pads on the market. This electric heating pad comes in two sizes, so you can choose the one best suited to your pet. The unit is covered with a durable waterproof material, making it suitable for use for any pet, whether they are ageing or ailing through arthritis or other injuries and illnesses, pregnant, nursing puppies or newborns. The electrical cord is covered with a stainless steel coating, making it resistant to chewing and other accidental damage and preventing the chance of electric shocks. Likewise, the thermostat mechanism is designed to avoid overheating and the unit uses a low voltage for safety and economy. The temperature is adjustable with two settings, high and low, and heats up to 104oF. There’s also a power-off control for added protection. The heavy duty cover is not removable, but can be cleaned easily with a slightly dampened cloth. Of course, the heating pad should be unplugged from the mains while you do so and left to completely dry before being used again. It’s advised that you don’t cover the heat pad with anything other than a light towel or blanket; and do not bend or fold the mat when in use. The product is covered by a three month guarantee and will be replaced by the retailer if the customer is dissatisfied. This dog house heating pad is thermostatically controlled and warms to your dog’s own natural body temperature. It will not exceed this, preventing overheating. The pad also runs at a low wattage and therefore is safe and economical to use. There are three sizes to choose from, so you can buy the appropriate dimensions for your pet. The unit comes with a free fleece cover, which is machine washable. Replacement covers can also be ordered from the manufacturer. The pad itself, once removed from the cover, can be wiped clean with a damp cloth; just wait for the entire pad to dry naturally before plugging it back in. The electrical cord is 5ft 5” long and is wrapped in steel to prevent even the most determined chewer from biting through the wiring, thus preventing the chances of electric shocks. In fact, the whole unit is MET Listed, which ensures it’s been tested and is safe for use indoors or outdoors. The WRCIBO Pet Heating pad comes in two sizes, medium and large, so you can select the correct dimensions for the size of your dog. The material it’s made from is flexible enough to be placed in any pet bed or on the floor of a kennel. It’s a great option in winter for pets that suffer from the cold, but also suitable for sick, convalescing and pregnant animals, newborns or helping to relieve stiffness in dogs with swollen or arthritic joints. The entire unit has been tested and is UL ETL listed. The pad remains on and maintains a constant temperature continuously, but as a good safety feature, the heat will cut off if the overall temperature rises above 131oF. There are seven heat settings between 77oF and 131oF, and an LED display allows the owner to easily check on the temperature while it’s in operation. The recommended setting is 104oF, which is in line with your dog’s normal body temperature. The 4ft 6”electrical cord is wrapped in a steel covering, ensuring any pet that likes to chew through wires is protected from electrical shocks. The pad is also waterproof and flame retardant, so you don’t have to worry about the unit shorting if it comes into contact with liquids or causing electrical fires. The unit can be cleaned with a lightly dampened cloth. This heat pad is covered by a twelve month warranty for your peace of mind. 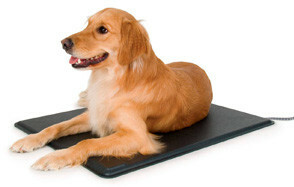 The IB Sound Heating Pad can be used for any small animal, so is eminently suitable for a dog. 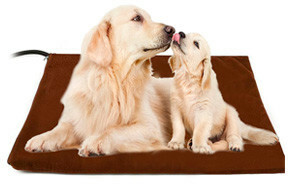 This heat pad is safe for pregnant and nursing dogs as well as ageing and/ or arthritic pets. It’s also appropriate for dogs that are ill or recuperating from injury or sickness. As it’s a flexible pad, it can be positioned wherever your pet likes to sleep, from on the sofa to within your dog’s own bed. The unit features seven heat settings, so you can adjust to suit your pet’s requirements. There’s a controller with an LED display, enabling an owner to keep an eye on the temperature, which will increase gradually and gently and stop rising once it’s reached the optimum for the setting chosen. In any case, the unit will never exceed 131oF, preventing the dangers of overheating. The cover is flame retardant and water resistant and can operate as either an indoor or an outdoor pet heating pad. The cover can also be quickly removed by means of a zipper and is fully machine washable for easy cleaning. The power cord is 5ft 5” in length and is water resistant for outside use, although it’s best to restrict this to sheltered areas such as porches, barns, and garages. The cord is also covered with a steel coating to prevent dogs or other animals from chewing through it, so preventing electric shocks or damage. Suitable for ageing and arthritic pets, sick or pregnant animals, the newborn or any small mammal suffering or recuperating from injuries or illness, the FLYMEI pet heating pad has seven heat settings. This enables you to adjust the heat setting to suit the circumstances. The overall temperature is set at an average upper limit of 102oF, within your dog’s normal body range. Owners can check the temperature on an accurate LED display, more reliable than doing so by touch alone. The manufacturer states that the pad will reach the set temperature within ten minutes once your dog settles down to sleep on it. The heat pad is entirely sealed and waterproof, making it ideal for use in a variety of situations, from in the kitchen to outdoors or in sheltered areas like porches, garages and so on. It’s also pet proof! The cover is designed to be soft enough to sleep on, yet to resist being chewed. Additionally, it’s easily removable – just unzip the zipper - and can be washed in the machine or by hand. In the meantime, it can be wiped clean with a damp cloth as it’s water resistant. If your pet does love to chew, but still needs the benefit of a heated pad, then this is a good option for you. The electric cord is shielded from even the sharpest of teeth with a heavy duty plastic wrapper, so safety is not an issue in this respect. The heat pad operates at a low voltage to avoid hiking up those energy bills. The manufacturer offers a full money back guarantee or replacement unit if you’re not satisfied and there’s a one year warranty for your protection. DOPA’s Pet Heating Pad is superbly versatile, featuring seven different levels of temperature (77oF – 131oF) , all easy to monitor on an ongoing basis through the inclusion of an LED indicator. This provides the owner with the opportunity to adjust the pad’s temperature to the ambient temperature and/ or the individual needs of your dog. As the manufacturer says, it can meet the requirements of, for instance, ageing, sick or pregnant dogs; puppies or those with arthritis. The pad comes in one size only, but bear in mind this is a heating pad only, not a full bed. While it can be used in isolation, it can also be placed on top of your dog’s existing bed or other sleeping surface. Your dog will naturally be drawn to position themselves to the heated area if he’s seeking warmth. While there is no need to place any covering or cushion on top of the pad, further layers can be placed underneath to insulate your pet from the floor or other surface. The length of the electrical cord is 59”, which can be extended with the use of an extension lead. The unit is durable and safe enough to withstand outdoor use. It has been tested and adheres to national electrical safety standards; and is guaranteed never to rise above your dog’s own natural body temperature, nor to shut off after a few hours. It’s also easy to clean. The fleece cover for the heat pad, which comes in blue or coffee, can simply be removed and thrown in the washing machine or washed by hand. The product is supported by 24/7 customer service and comes with a one year warranty. K&H Pet Products Crate Pads are manufactured in six different sizes, so there will be a pad with the ideal dimensions to suit any crate or dog. What’s more, each corner of the pad is slit so that the cushion can be neatly fitted into any size crate, if the floor is smaller than the overall pad. What’s more, the underside of each pad is non-slip, which prevents it sliding round the bottom of the crate and offers your dog stability as he moves around on it. Moreover, there are three options: odor-control, self-warming or memory foam. The odor-control version comes with a foam center that incorporates charcoal, which helps neutralize any doggy smells. The self-warming pads are not dependent on an electrical source, which makes them great for everyday use, use outdoors or in wet conditions without worrying about safety. They’re also good for keeping down the energy bills! And while all the pads are supportive yet comfortable, the memory foam option provides that extra touch of support and luxury for pets with aching limbs and joints. Additionally, K&H’s crate pads come in three neutral shades, tan, mocha or gray, so no matter what color your home (or dog! ), there will be one to suit. All pads in the range feature a soft microfleece sleeping surface covered by breathable mesh to allow air to circulate while your pet sleeps. The pads are all machine washable too, so they’re a breeze to keep clean and fresh. This product comes with a one year limited warranty in addition to your normal consumer rights. Whether you’re not sure if your pet would benefit from a heating pad or are wondering which is the best dog heating pad for your own requirements, the information below should help guide you to make your decision. So that you are not wasting your money, there are a number of factors you should take into account when purchasing a heated dog mat. Initially, make sure the options you are choosing from have good, informative product descriptions so you can check all these out. If you’re buying from a retailer like Amazon, it’s also well worth reading through the reviews and customer questions and answers. Information from genuine past customers can really help inform your decision. The size of your dog – you don’t want his limbs hanging over the edge or resting on the cool floor below; otherwise the heated element may well be futile. The way he or she sleeps: does your dog typically stretch out on their side or sleep curled up into a ball? Whether the bed pad will be used indoors or outdoors. This can be a safety issue, as a dog heating pad outdoor will need to be guaranteed safe if it gets wet. It’s also a relevant factor in terms of how the dog bed can be cleaned, as outdoor beds will undoubtedly suffer more if exposed to the elements. Whether you want one that uses electric or relies on thermo-reflective materials to warm your dog. An electrical pet warming pad can be an ongoing expense, although many use minimal amounts of power. But it’s also an issue in terms of safety, so where you’ll place the bed; whether there’s easy access to a power supply; and whether your dog is one that likes to chew cables and soft furnishings will also be important in your decision-making. How easy it is to wash. All dog beds will look tired and dirty from time to time. To get the most for your money – and to ensure the bed stays cozy and clean for your pet’s comfort – you need to know you can wash it from time to time. What is your budget for the purchase? Inevitably, we’re all on a budget of some sort. The key factor to remember here, though, is that as with most things in life, you get what you pay for. Cheaper beds may not stand the rigors of daily use, so it could be worth investing in a more expensive model from the outset as this may be more durable and offer better value for money over the longer term. The look of the bed. While your dog probably won’t care what color the bed is, it can be important to the house proud owner! If the heated dog bed you’re buying is going to sit in the living room or bedroom of your home for the duration, you’ll probably want to make sure it doesn’t clash terribly with your décor. It’s a small point when compared with your dog’s comfort, but worth bearing in mind. Here, we consider the advantages and what to look for when choosing the best heated dog mat for your pet. Q: Why does my dog need a heated dog pad? A: We all love our canine friends, and many of us spoil them without apology. But buying a heated dog pad for your pet may seem to be pampering above and beyond the call of duty! However, there are various reasons why dogs may need a little extra help with keeping warm. Firstly, dogs have a higher body temperature than people. Their average stands at 101 – 102.5oF (38.3 to 39.2oC) compared to a typical body temperature of a human: 98.6oF (37oC). So although they may have a fur coat to keep them warm, they can be just as susceptible to cooler temperatures as their human owners. Perhaps you live in an area where winters are especially cold, or your dog spends a lot of time sleeping outdoors, whether through necessity or choice. In these cases, a heated dog bed can give you reassurance that your pet will stay warm, even when the temperatures drop. If you don’t like your pet sleeping on your bed at night when the central heating or other heating is off, then a heated dog pad can help you ensure that your dog will stay warm after dark. They can also be a great incentive to owners who are trying to keep their dogs off the furniture at any time of the day or night! If you own a smaller breed of dog, or have a young puppy, whether healthy or ailing, then a small heated dog mat could help keep them snug and warm, safe from chills. Dogs with short haired coats can also be particularly vulnerable to cold temperatures. Additionally, older dogs might need a helping hand. As with humans, heat therapy can ease sore and aching joints and prove to be a positive boon for dogs suffering from arthritis or rheumatism, day or night. You should notice an improvement in your dog’s mobility when he wakes up from a nap on a heated dog bed. Q: What are the signs of hypothermia in dogs? A: It can be hard to tell if your dog is too cold. Their temperature might drop for any number of reasons, from shock to infection, as a result of the external temperatures or through consuming something toxic. But if your dog’s temperature falls below 99oF (37.2oC), then he or she is at risk of hypothermia. Symptoms you might see include shivering, stiffness, lethargy and generally being less active than usual. Q: Could my dog overheat on his heated dog pad? A: Pets, like humans, know when they’re feeling too hot or too cold. 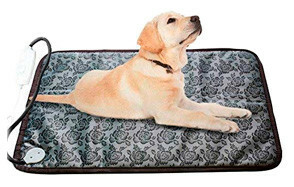 Provided your dog has the freedom to choose where he wants to be, he’ll use the dog pad when he’s cold and move away from it if he gets too warm. Just be aware if you’re using the heat pad in a confined space, like a crate, for instance, it’s best not to position this next to a radiator, fire or other heat source. Q: Are heated dog pads machine washable? A: Not all heated dog pads will be machine washable. It’s important to read the product descriptions very carefully before you part with any money, particularly if you are looking for washable dog beds. Commonly, the cover itself will be removable and this can be thrown in the washing machine. The heating pad itself should be able to be wiped down with a damp washcloth. Q: Are heated dog pads safe? A: Do you have a dog with a penchant for chewing? If so, and you know they make a beeline for electrical cables, then it’s worth thinking twice about buying a unit that incorporates an electrical heating pad. For these canines, a self-warming bed that reflects the dog’s own body temperature back will probably be the better choice. If generally speaking you can trust your dog around the electrics in your home and they have a need for a heated dog pad, then the electrical options are ideal. So what safety features should you look for? First, choose a reputable supplier of animal accessories. Ensure the pad is specially designed for pets and not humans, because there are different safety standards involved. Pets don’t understand how to use electricity safely, so you’re looking for something that will allow them to act naturally without putting them at risk. Also, as noted above, animals’ body temperatures differ from humans, so a heat pad that may be suitable for the latter could be too warm for the former. Make sure the pad you choose includes a thermostat. Look for one that describes its cable as being chew-proof. Some manufacturers cover the cable where it enters the mat with a strong, durable plastic or metal coating or cover that is resistant to even the sharpest teeth or the most persistent of gnawers. Fire retardant material is also an invaluable safety feature. This ensures that any material lying close to the heating element will prove resistant to sparks or ignition if something should go wrong. If you have any worries at all about the safety aspect, then it may be a better option to think about self-heating pet beds. These use the dog’s own heat and reflects it back to warm its body. There isn’t any electricity involved, so they’re potentially as safe as houses. Q: How can I clean heated dog pads? A: Pets, especially dogs, can get rather smelly. Of course, they also shed hair and some breeds produce excessive saliva and so on. And if you’re purchasing a dog bed warmer for outdoor use, it’s especially important to be able to clean your heated dog pad from time to time, as it may get covered in additional mud, dirt and grime. Each unit will come with its own instructions, which you should pay close attention to. Generally, most feature a removable cover for machine or hand washing. Others are waterproof and so can be wiped clean with a damp cloth. Never mix water and electricity, though: the heat pad should be turned off and unplugged from the mains while cleaning, and left to dry before being used again. Q: What size heated dog pad do I need? A: Proud dog owners often find their dogs adorable, especially when they’re asleep! If you’re trying to find the right sized bed for your dog, it’s worth considering what positions they get into when they’re fast asleep. Some love to curl up in a ball, others stretch right out to their full length when they’re truly relaxed. If your dog is a full length stretch addict, then measure him from the base of his tail to the tip of his nose. Any bed you choose for him should be at least this length, and perhaps even a little longer for luxurious stretching. That doesn’t necessarily mean that a curled up dog will need a significantly smaller bed. Bear in mind that your dog probably won’t just use his bed for sleeping. He may also want to lounge on it, watching the household members move around him, or chewing his favorite toys. Of course, if your heated bed pad is intended to fit into a specially designed canine crate, then you’ll be limited by the floor size of the crate. Dog beds with electrical heating elements shouldn’t be folded, so you will need to be more precise in this case. Don’t forget to choose a bed that’s bigger than your dog if he’s still growing, or if you have multiple canines and they like to snuggle up together!